In addition to free ice skating at Bryant Park, as part of the NYC launch of CLEAR 4G's network, on November 5th you can paint the Flatiron Building with MobiSpray. 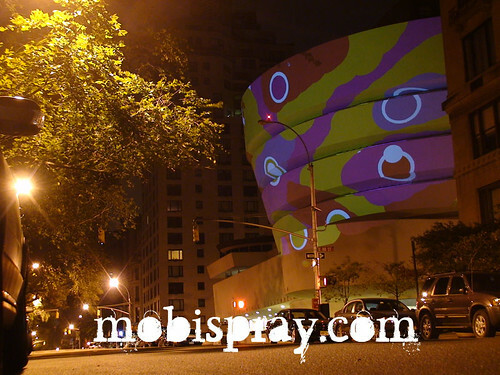 MobiSpray is an insanely awesome experience that turns your mobile phone into a virtual spray can that projects onto anything, including historic landmark buildings. On Friday, join Jürgen Scheible, the inventor of MobiSpray, and local graffiti artist Andy Dolan in painting the Flatiron. Photographers will be on hand to take pics of everyone's work, which can be found on the CLEAR 4G Facebook page. Sounds fun, and I'm sure your friends can't say they've ever written "___ was here!" on a building like the Flatiron (at least legally). For more info on the event and other CLEAR 4G events, click here.